September 22, 2013 - Tehran. IRANIAN GAME ASSOCIATION AND THE UNIVERSITY OF MAZANDARAN invite international student game designers to take part in the inaugural Global Student Game Developer Competition. The Global Student Game Developer Competition is a themed 24-hour game development event open to any student at a college or University. 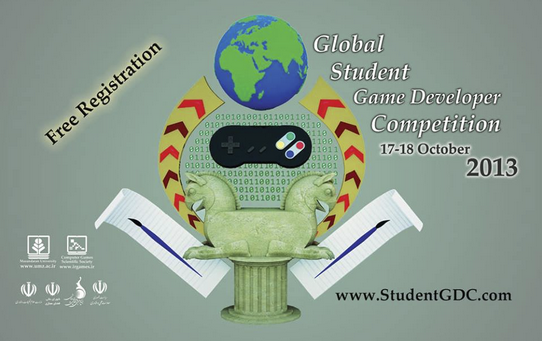 The competition will start on October 17, 2013 (8 AM GMT) as soon as the theme picture appears on the competition website (http://studentgdc.com). Each competitor must design a computer game inspired by the ideas in the theme picture. The competitor must upload the game on to the website. The deadline for the competition is 24 hours. Then the review process will be started to select the best game for the prizes. The winners will be revealed 17 November. By submitting to this competition, each competitor gives the organizers the right to play and distribute the game to competition personnel for the purpose of evaluating it. There are four divisions in this competition. Each game must belong to one of the following categories. Vita / PSD / Nintendo 3ds / OUYA / etc. It is noteworthy that this game competition is solely for students and every member of the team must be a student, so their work is processed to the main competition and are approved for the prize. In case of violation of terms, the team will be disqualified from the competition. Also please note that a non-student section part has been designed in which no prize is given and only commendation plates are handed out. In addition, special prizes may be awarded at the jury’s discretion. The competition closing ceremony will be held in Iran, on 5 March 2014. We anticipate financial asstance to be available for winning teams who wish to attend in person.